January is a good time to reflect on the past 365 days and recognize accomplishments as well as areas for improvement. But it’s also a great time to look ahead and start getting excited for the possibilities that the New Year brings. Whether you’re already working out regularly or you’re ready to hit the reset button after an extended hiatus from physical activity, it’s time to get ready to attack 2014 full of energy and excitement. This year people are going to look at you differently. You’re going to be in the best shape of your life—bigger, stronger, and leaner than ever before—and the possibilities from there are limitless. Are you ready to change the game? There’s no better time than right now. You can’t “out-train” a poor diet. In other words, no amount of hitting the gym can totally offset the waistline-inflating effects of bad eating habits. Generally speaking, exercise alone is relatively ineffective for fat loss; dietary modification is the real secret to melting away pounds of belly fat. The key to getting noticeable results in record time is pairing an effective muscle-building workout with an efficient fat-burning diet. This program provides you with both. All of your training in the gym will be geared toward building and maintaining muscle, not burning fat. While traditional cardio, boot camps, and cross-training protocols all have their merits, the core of our program will be hypertrophy-based strength-training routines to build and preserve lean muscle. We’ll let the diet take care of fat burning. You’ll train for a total of four days per week. Two days on, one day off, followed by two days on. You’ll end the week with two days of rest, then restart the cycle. Grasp a pair of dumbbells and lie on a bench. Press the dumbbells straight over your chest. Keeping your elbows tucked to your sides, slowly lower the dumbbells until they are in line with your body, and press back up. Grasp a dumbbell in your right hand and lie on the floor with your knees bent. Press the dumbbell over your chest. With your elbows tucked, lower the dumbbell until your triceps touches the floor. Press the dumbbell back up. Switch sides and repeat. Pick up a dumbbell in your right hand and push your hips back until your chest is parallel to the floor, back straight. Let your arm hang. Row the dumbbell to your side, keeping your shoulder blade back throughout. Slowly lower the dumbbell. Switch sides and repeat. Set an incline bench to a 30-degree incline. 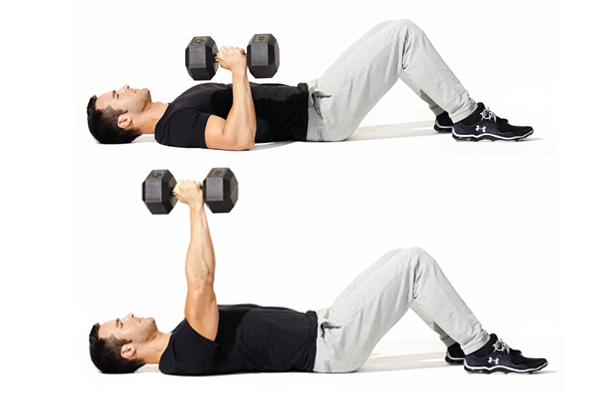 Grasp a pair of dumbbells and lie facedown on it so your chest is supported and pull your shoulder blades down and back. Row the dumbbells to your side and slowly lower them, keeping your shoulder blades down and back throughout. Place a loaded barbell on the floor and stand with your shins against the bar, feet wider than shoulder-width apart. Push your hips back, allowing your knees to bend, and reach down and grasp the bar with an overhand grip. Your elbows should be between your knees. Drive your heels into the floor and stand up. Grasp a pair of dumbbells, holding them so the heads of the dumbbells are touching your shoulders, keeping your elbows high. Push your hips back and squat down, feet slightly wider than shoulder width, with the pressure in your heels. Drive your heels into the floor and stand up. Lie back down on the ground, hands extended overhead, and feet slightly off the ground. Keeping your arms and legs straight, crunch up so your hands and feet meet over your midsection. Slowly lower back down. Set up in a calf raise machine, with your heels hanging off the platform. Slowly lower your heels so there’s a stretch in your calf, keep your legs straight, and drive the balls of your feet into the platform so your heels are above your toes. Grasp a chinup bar with an underhand grip, bend your knees, squeeze your glutes, and pull your shoulder blades down and back. This is the start position. Pull yourself up to the bar so it is in line with your collarbone and slowly lower yourself to the start position. Hold onto the edge of a bench with both hands fully extended and shoulders-width apart. Extend your legs forward with a slight bend of the knees. Slowly lower yourself by bending at the elbows until reaching parallel with the floor. Drive upward and repeat. Grasp a barbell with a bench-press grip and hold it in front of your body. Slightly bend your knees, then explosively extend your hips, knees, and ankles while pulling the bar up so your elbows are in line with your shoulders. Allow the weight to come back down, keeping your shoulders down and back throughout. Grasp an EZ-bar with an overhand grip and lie back down on a bench. Press the bar over your chest. Your hands should face slightly in and be shoulder-width apart. Keeping your elbows in place, slowly allow them to bend so the bar comes down behind your head. Extend your elbows to return to the start position. Grasp a pair of dumbbells and hold them by your sides with your elbows flared out. Curl the right dumbbell so your arm comes up in front of your body and the back of your fist faces in front of you. Slowly lower the weight, switch sides, and repeat. Stand a few feet away from a bench, back facing toward it. Raise your right foot and place it on the bench behind you. Keeping your chest up and your left heel on the floor, slowly lower yourself toward the floor so your right knee almost touches the ground, and drive your heel into the floor to return to the start position. Switch sides and repeat. 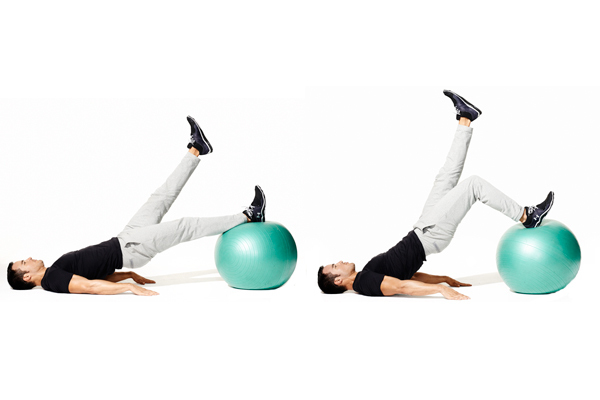 Lie on your back with one calf on a stability ball and the other leg straight in the air. Squeeze your glutes to bring your hips off the floor. Pull the leg on the ball in toward you so your knee is bent at least 90 degrees, lifting your hips throughout (there should be a straight line between your shoulders and knees). Slowly allow your knee to extend, keeping your hips up throughout. Switch sides and repeat. Lie back down on the floor, knees bent. Lift your left foot off the floor. Squeeze your right glute, lifting your hips so there is a straight line between your right hip, shoulder, and knee, hold for a second, and slowly lower your hips down. Switch sides and repeat. Get into a pushup position on the floor, then drop down to your elbows. They should be right under your shoulders. Hold the position. Hold a medicine ball in both hands by your right hip. Your chest and shoulders should face toward the right as well. Turn your shoulders and raise your arms, so your chest and shoulders face toward the left and the med ball is above your head. Switch sides and repeat.